Big Alfas have never had a good reputation - and the 166 doesn't change that. Many years ago, there was an Emperor, who was so excessively fond of new clothes, that he spent all his money in dress. Time passed merrily in the large town which was his capital; strangers arrived every day at the court. One day, two rogues, calling themselves weavers, made their appearance. They gave out that they knew how to weave stuffs of the most beautiful colours and elaborate patterns, the clothes manufactured from which should have the wonderful property of remaining invisible to everyone who was unfit for the office he held, or who was extraordinarily simple in character. "These must, indeed, be splendid clothes!" thought the Emperor. "Had I such a suit, I might at once find out what men in my realms are unfit for their office, and also be able to distinguish the wise from the foolish! This stuff must be woven for me immediately." And he caused large sums of money to be given to both the weavers in order that they might begin their work directly. So the two pretended weavers set up two looms, and affected to work very busily, though in reality they did nothing at all. They asked for the most delicate silk and the purest gold thread; put both into their own knapsacks; and then continued their pretended work at the empty looms until late at night. Soon the whole city was talking of the splendid cloth which the Emperor had ordered to be woven at his own expense. The Emperor himself wished to see the costly manufacture, while it was still in the loom. Accompanied by a select number of officers of the court he went to the crafty impostors, who, as soon as they were aware of the Emperor's approach, went on working more diligently than ever; although they still did not pass a single thread through the looms. The rogues sat up the whole of the night before the day on which a procession was to take place, and had sixteen lights burning, so that everyone might see how anxious they were to finish the Emperor's new suit. They pretended to roll the cloth off the looms; cut the air with their scissors; and sewed with needles without any thread in them. "See!" cried they, at last. "The Emperor's new clothes are ready!" "How splendid his Majesty looks in his new clothes, and how well they fit!" everyone cried out. "What a design! What colours! These are indeed royal robes!" 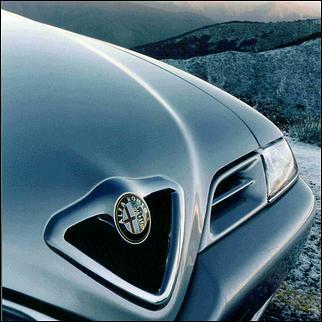 And such a naked Emperor is the Alfa 166. Those golden threads do not exist, and irrespective of the claims of many, this remains a car where the image is staggeringly greater than the reality. 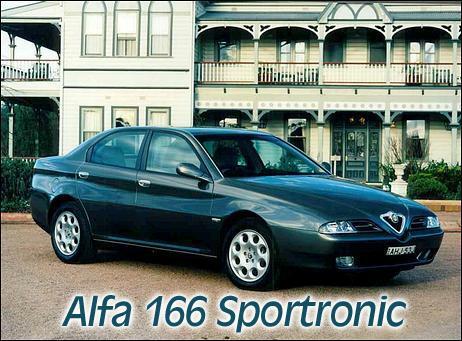 The Alfa 166 is a $76,000 car that has a drivetrain far less refined, far less driveable and noisier than a $48,000 Avalon Grande, let alone a $29,000 Magna Executive. With at times the worse throttle response of any car that we have ever driven, the supposedly hi-tech auto transmission is appallingly matched to an engine that develops peak torque at a sky-high 5000 rpm, with peak power just another 1200 rpm higher in the rev band. The engine is coarse and lumpy at idle, with the characteristic (one that we last saw in new cars a decade ago) of having a poorer idle quality in Drive than in Neutral. At some part-throttle cruise positions, resonant booms fill the cabin - induction or exhaust, we're not sure which and it doesn't matter - while even with the transmission in its Sports mode, its shift behaviour falls behind every other 'intelligent' auto we've driven. At full throttle - required quite often in normal driving if you leave the trans in Drive - the engine is loud and coarse, vibration being fed through both the pedals and the wheel. And it's not even a sweet note - "engine sounds like a bus," wrote one of our testers. The Alfa feels like it has its claimed 166kW only when revved between five and six thousand rpm; elsewhere it can be genuinely frightening in its lack of power. This is a car in which it is easy to pull out in front of a line of moving traffic, and then be forced to mash the throttle to the floor, teeth gritted and eyes fixed on the rear vision mirror watching the traffic bearing down on you as you growl, "Come on, come o-o-o-n!" Look under the bonnet and be immediately transported back fifteen years in engine technology. The 24-valve 3-litre V6 has fat chromed intake runners hose-clamped into place - reminiscent of some mid-Seventies Toyota engines. The lack of variable valve timing - talking of Toyotas, even a $15,000 Echo has variable valve timing these days - and a variable intake manifold show up in that utter deficit in bottom-end and mid-range torque. And what about that 275Nm peak torque figure? The humble $36,000 Nissan Maxima develops more torque no less than 1400 rpm lower in the rev range - and the 3-litre V6 Nissan has only 5 per cent less peak power. Whichever way you stack the figures, positioned in front of an auto trans in a body that weighs 1550kg, the Alfa V6 is simply way off the pace. Sure, you can get performance figures in the low nines for the 0-100 sprint, but only by loading up the trans with your feet on the throttle and brake and then launching as hard as you dare. Leave the transmission in Sports mode and accelerate away from rest in a more normal manner and you're talking times in the high tens - and that's exactly how slow the car feels, too. It's only on the open road when driving hard in the gears - revs always kept between 5000 and 6500 rpm - that the Alfa starts to move; then the power figure becomes believable. But pedalling around town you'd put money on the kilowatts being more like 140, tops. Certainly, we can't think of any other auto 3-litre six that would be in the slightest bit troubled pulling away from the 166 in the normal cut and thrust of urban traffic. 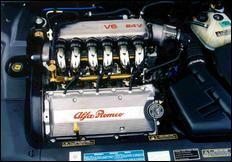 In fact the performance was so disappointing, we booked the Alfa for a run on DAT Racing's Dyno Dynamics rollers. The result? A peak power of just over 104kW at the wheels! That's some driveline loss from the engine's claimed 166kW, isn't it... Even more interesting is the appalling torque curve. 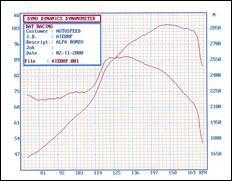 The dyno run shown here was conducted in third gear from 2500 rpm to the 6800 rpm cut-out. As you can see, below 4000 rpm, the torque is miserable. Then there's a 14 per cent jump across only a few hundred rpm before it again trails away. This is the sort of power development we expect to see from a poorly modified engine that's running aftermarket top-end cams, not that of a supposedly sophisticated luxury car hauling around a heavyweight body! Fuel consumption is very poor, especially given the mediocre performance. Alfa's own figures quote an incredibly bad Euro city cycle of 19.4 litres/100km and an out-of-town figure of 9.3, while typical test results have resulted in around 15 litres/100km. That latter number's about 25 per cent worse than a car of this size, weight, and performance should give. But after you drive the car it's not a surprising figure - the electronic throttle control and dreadful trans mean that in city conditions the driver is often using huge throttle openings just to keep up with traffic. It's very strange indeed. So perhaps the 166 is one of those Euro marvels that has capacious room surprisingly packed within compact exterior dimensions? Not bloody likely! If we could see the emperor's clothes we'd say that the interior is 'snug' and 'form-fitting'; but we can't see those threads and so the words 'cramped' and 'poorly designed' spring to mind. If the front seats are right back the rear room is woeful - tall people will be squeezed for both knee and headroom. At least there'll only be two of them - the deep sculpturing of the rear seat means that a third person will be very uncomfortable indeed. 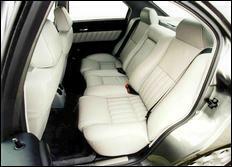 And there isn't even a whole lot of room up front - it might be a 'big' Alfa but it's really a bit squeezy inside. The A-pillars are extraordinarily wide. Making their vision-impairing function even worse is the shallow windscreen rake - a small person, comfortably seated behind the wheel, has the top portion of the A-pillar only 300mm or so away from their face. And how wide is that pillar? No less than 100mm! Position a 100mm wide object that close to your eyes and you'll see just how dangerous it is. Not only must you move your eyes when assessing other traffic, but you must also swing your whole head back and forth to see past the monstrous blockage. With the primary vision badly impaired, and with the throttle response at times dangerously slow, you wonder at the priorities that are being used. The safety aspects of the two airbags start to look a little silly when your chances of actually having an accident are heightened by poor basic design. The 166 is lavishly equipped. Included in the base price are front heated electric seats; leather; climate control; cruise; stacker CD cassette radio; excellent leather steering wheel - and probably some other things we've forgotten. 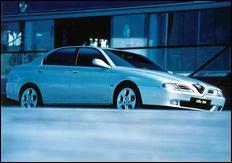 The test car was also equipped with VDO/Daytron satellite navigation, an optional extra. 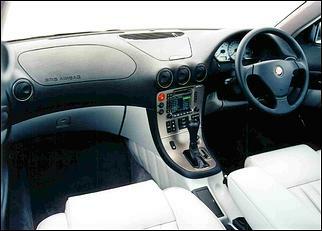 The navigation, trip computer (ah, that's what we left out), sound system and climate control are all displayed on a colour 100 x 70mm LCD screen set into the centre of the dash. It's positioned a bit low for tall people to read its top section - something important when the navigation screen has text info in the upper 10mm or so of the screen. Integrating all of these functions into one display system is a major change over traditional controls - as a result, it takes some getting used to. However, in general it all works quite well, although there are some annoying little traits. One of these is the fact that the display doesn't automatically change to reflect the control being actuated. 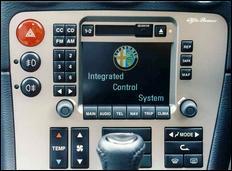 So, if the screen is showing navigation instructions and you alter a climate control setting, the screen stays showing route instructions, rather than briefly flicking across to climate control so that you can see what changes you're actually making. The ride and handling is a mixed bag. In urban conditions the ride is a little jiggly; short, sharp bumps get through and at times a front suspension patter can be felt. Over speed humps the lack of suspension travel and ground clearance becomes obvious - it's not hard to bottom-out the suspension or brush the underside of the nose against the road. The upside is that through roundabouts and around other urban corners the 166 sits flat and unflustered, cornering with aplomb. Unfortunately, the 166 is not so reassuring on challenging open-road corners that dip and weave. There it can develop a wallow and the 215/55 Goodyear Eagle Touring tyres are always being worked hard - in fact tyre squeal can occur at speeds that in other cars would be regarded as not high. The rear suspension also feels wanting - its travel is short and it can become unsettled over bumps. 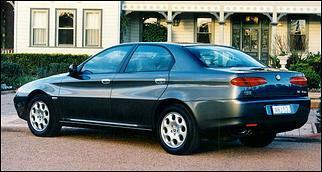 However, when moving very quickly in a straight line, the Alfa's stability is excellent. Brakes are large - 308mm front ventilated discs and solid 276mm rears - controlled by ABS and electronic brake distribution. However - and there are lots of 'howevers' in this story - while in general use they are progressive with a light pedal effort, in an emergency stop the nose dips, the tail lifts and the car comes to a halt feeling a bit unsettled. There's none of the 'inexorable giant hand pulling you back' feeling that you get when tromping the centre pedal in a Mercedes - any Mercedes - although it should be noted that the Alfa's retardation at very high speeds is good. So what are we to make of this severely flawed car? 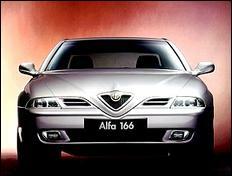 It is certainly an indication of how the automotive world has startlingly changed over the last decade when it can be said without any fear of contradiction that the Alfa 166 would be a far better car if equipped with the drivetrain of a Toyota Avalon or Mitsubishi Magna. Or, if you wish to keep loads of top-end power, the Honda Odyssey's V-TEC V6 is streets ahead of the Alfa in terms of its driveability and engine/transmission match. And as for the rest of the car? The equipment level is good (although sometimes less than outstanding in the execution), the steering excellent, and the ride/handling trade-off acceptable. With Alfa's history of poor retained values in its larger cars, you can be sure that a few years down the track the 166 will be available very cheaply indeed. But, even at $50,000, we'd still not be much interested. And new at $80,000 on the road, forget it.